The Grampaw Pettibone Squadron was pleased to have as guest speaker, Captain Robert(Bob) Olds, USN, Retired. 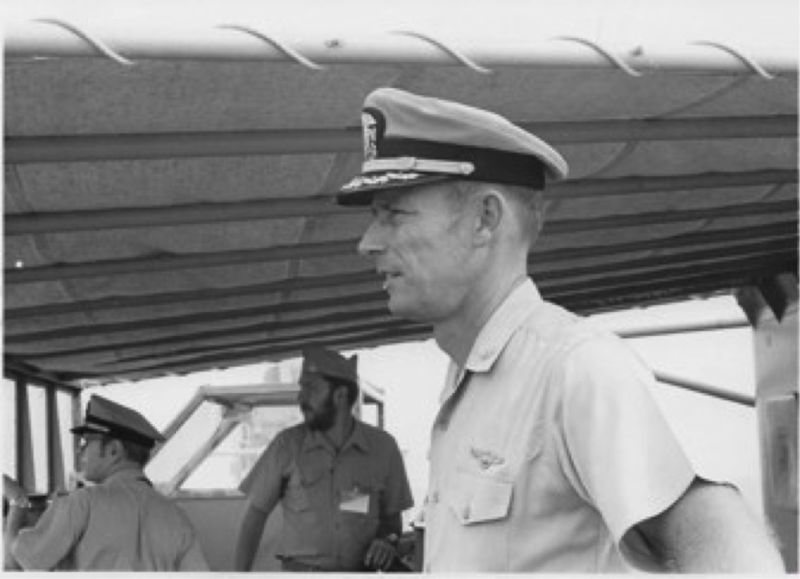 The Captain was a former Commander of the Grampaw Pettibone Squadron, with experience as both a Naval aviator and ship captain. Information that Bob shared was drawn from his personal experience as well as information and photos from the ships Master, Captain Pat Moloney and Mr Bob Fish, a Trustee with the USS Hornet Museum. He shared his command experience and knowledge of operations of the USS Hassayampa, a US Navy fleet replenishment oiler from 12/72 – 7/74. 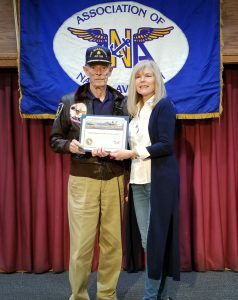 Bob asked; “What is a museum dedicated to the history of the old west in Wickenburg, Arizona have to do with a Navy ship?” He explained that in the past, Navy Fleet Oilers were named after rivers. The ship our speaker commanded was named for the Hassayampa River, which flows through Wickenburg, Arizona. Apache Indians referred to the river as the “upside down river” because it flows mostly underground. There continued to be a long term relationship between the ship and the city as a result of the name, including crew reunions being held in Wickenburg over the years. Bob served 31 years in the US Navy, 1953-1984 holding 6 commands. From 1955-1972, he served as a Naval Aviator flying the P2V, “Neptune” and P-3 “Orion”. He described these flights as ‘chasing submarines’. From 1959-1960, he conducted Arctic “Ice reconnaissance” flights in preparation for US Nuclear submarine missions under the ice. Drawing from experience as a Navy pilot, Bob became Navigator for the USS Wasp, aircraft carrier and learned about navigation requirements for a large ship and its general operation. The USS Hassayampa was launched in September 1954 out of Camden, New Jersey, and commissioned in April 1955. She served her entire career in the Pacific and throughout the Indian Ocean and Persian Gulf. The ship had a hull length of 654.8 feet, beam of 86 feet, draft of 35.1 feet and displacement of 38,000 ton when full. Because of the deep draft it was critical when moving to know the depth in all areas. Bob noted that below decks the construction in the forward section were tanks for ballast or fuel oil and amidships were 24 tanks in 8 rows of 3 tanks each carrying fuel. She carried nearly 8,000,000 gallons of various fuels (Navy Special Fuel, Av Gas and JP-5). In the rear or the aft of the ship was the engine room, boiler room, shops, offices, crew quarters and crew mess. The basic design depicted a tanker. From the description below-deck one adds above-deck a few masts, hang hoses of various sizes, cables, steam-powered winches, larger pumps to move the fuel faster, creating a fleet oiler. The USS Hassayampa (AO-145) served as a naval vessel from 1955-1978 and then from 1978-1991 as a merchant marine ship (T-AO-145). As a naval vessel the crew included about 300 Officers and Enlisted. With the new designation, the ship had a smaller crew size (106 civilian and 21 Navy) and brought technical resources on-board only when needed for servicing or repairs. As a merchant marine vessel, all deck guns previously in place during Navy service were removed. Bob described the challenges associated with an oiler conducting multiple ship refueling procedures in WWII. When an oiler replenished more than one vessel, it travelled between both ships about 60 feet separating each vessel from the oiler. The movement of all three vessels combined with the physics associated with pressures created by the narrowed space was a challenge that had to be controlled manually by the ship’s helmsman. Advances in fueling procedures and equipment widened the space to 120-150 feet of separation and even further under current operations. In addition to fueling operations, military activity also included the transfer of ammunition, bombs, supplies and occasionally crew. Bob displayed a series of photos to describe how an oiler would approach a ship and prepare to carry out a replenishment process for fueling and supplies. Among the photos were a series that contained earlier supply ships, oilers and later oiler/supply ships. The hull configuration and upper deck construction changed over time. Our speaker was Commander of the Service Squadron indicated in the photos. A supply ship/oiler was a floating community and provided a host of services for the crew. Photos shown were everything from housing, food service, banking, utilities, machine shop to police, post office, fire-fighting, etc. Training associated with fire-fighting at sea was a critical assignment and had to be carried out with efficiency and dispatch. While there was an assigned damage control team, all crew members were introduced to fire fighting training. Bob described a typical deployment that took place during the Vietnam War(1972-73). 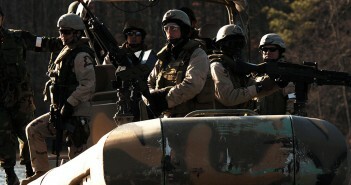 Though the deployment was to be for a 6-month period, the crew was out for 300 days. Some 269 ships were refueled and over 81 million gallons of fuel transferred. This also included 242 tons of freight and 158 passengers transferred between ships. As to the construction of the Hassayampa, our speaker noted that each anchor chain link weighed about 65 pounds and the anchor weighed around 35,000 pounds. When on the bridge, one could feel the vibration of each link as the chain dropped into the water. Examples of each crew station on board included one of the quartermaster while steering the ship and observing his course by noting the compass and course. This duty was to focus exclusively on the compass and not what was viewed outside. A one degree deviation in heading would result in a 20 ft. sideways movement, which could be critical at a 120-150 ft. separation with a ship taking on fuel or supplies. Duty assignments included a safety officer who stood alongside the quartermaster, making sure the command given for a heading was understood and carried out as instructed. An added safety feature was the assignment of an aft-steering helmsman who monitored all compass headings at his station and took over steering should the bridge lose steering due to an operational issue at the helm. Additional photos and explanation of duty stations on-board included; fuel sampling to check for water, oil spills on deck, personnel transfer by boatswains chair and deck gun training. Also, some photos demonstrated rescue of refugees in small boats, and ship support service for Apollo 11 and 12 recovery. During a maintenance and resupply of the Hassayampa in Pearl Harbor, the Captain was ordered to steer for Pago Pago, American Samoa some 2300 miles southwest of Pearl. The ship was reassembled, loaded with fuel and supplies and for 6 days travelled to Pago Pago to service a US Navy ship on station observing delayed French atom bomb tests. After servicing the ship, Hassayampa travelled 6 days back to Pearl Harbor and resumed maintenance and servicing before the next assignment. Three weeks after returning to Pearl, the ship was once again instructed to return to Pago Pago and fuel the ships on station. Reassembling the ship, taking on fuel and after a 6 day plus journey, two ships were fueled at sea by steaming at five knots at the stern and taking over 40 hours to transfer fuel. Our speaker displayed some photos of the events associated with the line-crossing ceremony. This is a naval initiation that commemorates a person’s first crossing of the Equator. Some members in the audience when asked by our speaker noted their having completed this initiation. Among the traditional duties on board was maintaining the shiny appearance of the ships bell by the cook. Completion of a tour and return to port included a welcoming committee, of family and friends of the crew. However, all on shore had to wait due to the careful nature of bringing this size ship slowly in to the port and secure it at the dock. The Hassayampa was decommissioned on October 2, 1991 and went into the reserve fleet the same year. It was struck from service November 7, 1994 and sold for scrap in April 2014 with scrapping beginning July 2014 and completed in 2015. The Hassayampa was the most decorated Fleet Oiler in the US Navy.